(Nanowerk News) Even moderate concentrations of a nanoparticle used to whiten certain foods, milk and toothpaste could potentially compromise the brain’s most numerous cells, according to a new study from the University of Nebraska-Lincoln (Nanoscale, "Mitochondrial dysfunction and loss of glutamate uptake in primary astrocytes exposed to titanium dioxide nanoparticles"). The researchers examined how three types of titanium dioxide nanoparticles, the world’s second-most abundant nanomaterial, affected the functioning of astrocyte cells. Astrocytes help regulate the exchange of signal-carrying neurotransmitters in the brain while also supplying energy to the neurons that process those signals, among many other functions. 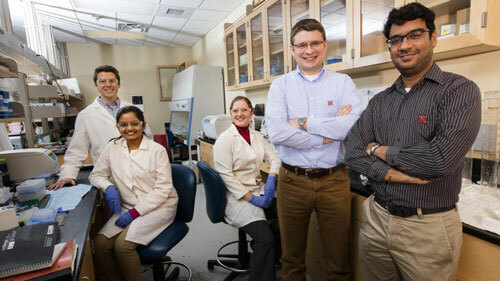 UNL researchers (from left) Stephen Hayward, Vaishaali Natarajan, Christina Wilson, Oleh Khalimonchuk and Srivatsan Kidambi contributed to the study.